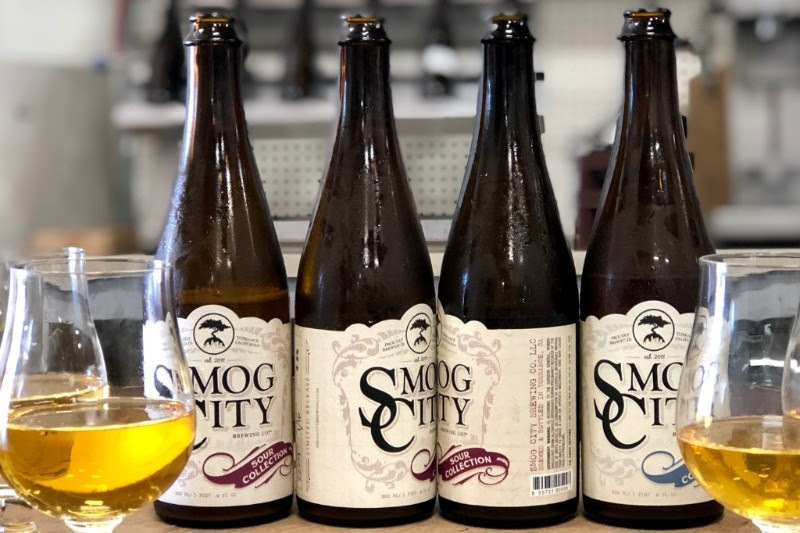 On Saturday, November 10th we’re opening our doors to the Smog City Wood Cellar where our barrel keepers Cesar and Toby have been hard at work crafting some of the most creative and unique beers ever to be tasted. We’re so proud of what’s come from a journey that began over 5 years ago as a handful of wine barrels. We want to show off what it has blossomed into and where it’s going in the future. Please join Cesar, Toby, Porter and the rest of the Smog City team for an entire day of everything sour, funky, and educational! Rare and Experimental wild ales on tap and in bottle will be released throughout the day. Most have never been tapped and only a few gallons exist so availability is limited! Quercus Circus – Our classic lambic inspired wild ale that blends 3 different vintages of 3 beers aged in 3 different types of oak. SnuggleBug – Sour blonde With Raspberries and Boysenberries. Floret 2.0 – Foudre Saison made with a hand selected blend of botanicals and honey. Brett Conditioned. Type O Positive – You’ve had the negative. Now try the second entry into our blood type series. Sour ale with boysenberries, lavender, and rosebuds. Rodeo Eroded – Dark Saison with roasted corn, ancho chili, and raw dark wild agave- Plenty of Brett too of course! Brux and Lambicus for conditioning. Kabocha Squash Dark Saison – Dark saison with buckwheat honey and 23 pounds of raw kabocha squash roasted in house and refermented with 2 Brett strains. Even more beers will be tapped throughout the day, along with a few surprises of magnum proportion! We also have much more in store for the day. What else, you ask? Could there be more?!! Porter has raided his personal stash at the Smog City sour cellar for rare bottles to be re-released into the wild. Supply is extremely limited so don’t miss out! Personal tours of the sour cellar from the people who make the beer to give you in-depth insight into how these beers are made and to share our vision of the future. Exclusive growler fills of Smog City Sour beers! Anarchy Seafood and Tomsky Sausage will be creating food pairings for us all day and night. We also have a very special bottle release planned for the event! For the first time ever on draught and in bottles… Quercus Circus! In a nod to the storied Belgian lambic style of our sour ales we present Quercus Circus, a blend of sour golden ales aged in oak barrels, which like its inspiration sits at the pinnacle of complexity and elegance achievable in a beer. The initial impression favors the fruity end of the flavor spectrum with the suggestions of soft muscat grape, sharp tartness of a granny smith apple, and fresh-cut pineapple atop a champagne-like effervescence. Mid palate, alongside the fruity component, a melange of musty, floral, and peppery qualities- imparted by the unique microflora used in fermentation- emerges briefly before succumbing to a clean, assertive lemony tartness on the finish.